LAS VEGAS – A month ago, Clay Elliott won the Canadian saddle bronc riding championship thanks to earning $42,978 at the Canadian Finals Rodeo, a six-round championship in Edmonton, Alberta. He’s earned about that much in just four nights at the Wrangler National Finals Rodeo, $42,842. Throw in the $10,000 bonus paid for qualifying for the finale, and Elliott’s Vegas earnings are nearly $53,000. 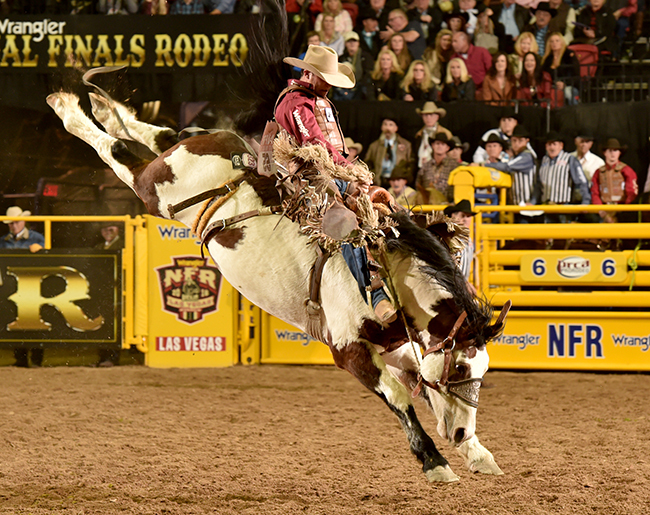 The Canadian cowboy failed to place in any of the first four go-rounds. Since then, he’s earned four straight paychecks, with his biggest coming Thursday night when he rode Burch Rodeo’s Lunatic Fringe for 86 points to finish as the eight-round runner-up. That was worth $20,731. What’s even better was that it was on Canada Night at the NFR. It didn’t hurt that he put on a strong spur ride on a great bucking horse with a grand history. He did, and it paid off well. More importantly, it provides him with more momentum and confidence heading into the final two nights of the season.